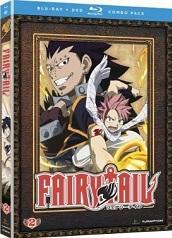 Overview - The 'Fairy Tail' story continues as wizards Natsu, Lucy, Gray, Erza and Happy conclude the mission on Galuna Island and are placed in danger by Lucy's shrouded past. I've been looking forward to reviewing 'Fairy Tail: Part 2' ever since 'Part 1' left off with a huge cliffhanger. The great thing about the 'Fairy Tail' Blu-ray release strategy is that FUNimation is pumping them out in 12-episode Blu-ray sets each month. 'Part 2' is furthering my idea that each set will end with a in the middle of a major story arc. 'Part 1' ended with our central characters in over their heads. Natsu, Lucy and Happy had taken a job off the S-class bulletin board (a more dangerous job class that requires only the most skilled of wizards). When the guild leader Makarov discovered they'd chosen a highly dangerous out-of-their-league mission on Galuna Island, he sent out team members Gray and Erza to rescue and bring them back for punishment. But when relief showed up, Natsu, Lucy and Happy were beyond the point of no return. Gray and Erza had no choice but to help get the seemingly impossible job done. As the series has been running in Japan, it hasn't taken breaks in the same spots that these American discs have. Everything found in parts one through four are actually just part of the original first season of 'Fairy Tail,' meaning that each of American releases so far are just segments of the first season. As we watch them, despite having to wait for the next "part" to be released, they connect and flow seamlessly. The first six episodes of 'Part 2' are spent resolving the major story arc on Galuna Island. Once that is completely wrapped up, we get two silly stand-alone episodes. In the first, several members of Fairy Tail are put under a curse that causes them to switch bodies. Wackiness ensues. While the second appears to be (and mostly is) the origins story of Happy, some very important clues are peppered throughout the episode that become important in the next story arc. After the two fluffy episodes, we begin our next big plot. Be prepared – 'Part 2' cuts off smack dab in the middle of it. Upon walking to work one morning, the gang realizes that another guild has viciously destroyed Fairy Tail's headquarters. The final four episodes are dedicated to finding out who attacked the empty building and why. I'll refrain from telling you who tore it up and why, but know that it deeply affects our central team's characters. At the same time, this threatening attack infuriates every other member of Fairy Tail, so it turns into an epic guild-on-guild brawl that spans several cities. Towards the end of this arc, the hints from Happy's back-story become significant as we learn more about Mirajane and her brother Elfman. The moment that 'Part 2' ends, it leaves us hanging even more than 'Part 1' did – but, like I said, we only have to wait a month to get the next set. I've really enjoyed the creativity of 'Fairy Tail' thus far. It's almost like a continuation of the 'Harry Potter' world if wizardry wasn't a secret to muggles and all wizards became hired helpers and mercenaries upon graduation. New concepts and twists on the world of wizardry are constantly being revealed – news types of magic, powers ets. 'Fairy Tail' never feels stagnant, repetitious or boring and it always remembers to put the fun first. Although the big arcs tend to get more serious, wisecracks, jokes and puns are still present. If you've gotten into 'Fairy Tail,' good for you. If not, get on it. It's fun, light-weight and it just keeps getting better. 'Part 2' arrives on Blu-ray with a smooth 1080p/AVC-MPEG-4 transfer shown in a 1.78:1 aspect ratio. When intended to be, the motion of this animation flows along naturally. The only times that the image's movements appear choppy are when they attempt slow motion or when a spastic characters is meant to be jittery. Artifacts and aliasing are absent, but banding frequents about one time each episode, typically in the sky or in bright beams of light. Where the picture quality is perfectly crisp and clean, the lines aren't as defined as they could be. The comparison could be made to the images being drawn with a fat sharpie instead of a fine pencil. It's never annoying or distracting, but simply could be better. This style of anime is quite colorful, full of vibrant primaries that may all share the screen at the same time. 'Fairy Tail' is no exception and this transfer highlights the well-saturated palette. Only one English option is available for 'Fairy Tail,' a clean lossless Dolby TrueHD 5.1 Surround track. The only other foreign language track included is a Japanese Dolby TrueHD 2.0 track. The first thing you hear when you start the series is the intro and the Japanese pop-music opening credits. As the theme song plays, each channel fills with music only. This usage drops your room right into the magic-filled world described in the intro just prior. After the credits are finished and the episode begins, the audio mostly shifts to the front. Note that the "textless" song features on disc two of this set are exactly the same as they appear on 'Part 1.' Shame on you, FUNimation, for recycling special features. Audio Commentary - Only two episodes in 'Part 2' feature the optional commentary – episodes 15 and 19. Both are found on disc one. ADR director Tyler Walker and Newton Pittman, the voice of Gray, offer the commentary on Gray-centric episode 15. Walker again gives commentary with fun ladies Tia Ballard (Happy), Monica Real (Mirajane) and Colleen Clinkenbeard (Erza). Textless Opening Song "S.O.W. Sense of Wonder" (HD, 2 min.) - Once again, watch the opening credits of the show without the text of the credits getting in the way of the playful animation. Trailers (HD) – A few of the trailers are identical to those on 'Part 1,' but a few are for new seasons / releases. Included are 'Hetalia World Series,' 'Birdy the Mighty: Decode,' 'Gun X Sword,' 'Kaze No Stigma,' 'Nabari No Ou,' 'Sengoku Basara: Samurai Kings,' 'Fairy Tail: Part 3' and FUNimation.com. After getting into, falling in love with, and being left hanging by 'Fairy Tail: Part 1,' 'Part 2' quickly came along and sated my thirst – only to leave me hanging once more. The stakes are higher than they were in 'Part 1' and it's obvious that the heavy content we're getting into is just the beginning of another major story arc, but despite taking serious turns, the series still manages to keep the comical and fun content. The video and audio qualities are almost identical those of 'Part 1' – very good, but not quite demo-worthy. The picture could be a tad sharper and the audio needs to use the surround and rear channels more often, occasionally passing on missed opportunities. Like I said before, this isn't a series to show your young kids – but it sure does please the kid the within. 'Part 3' can't come quick enough.